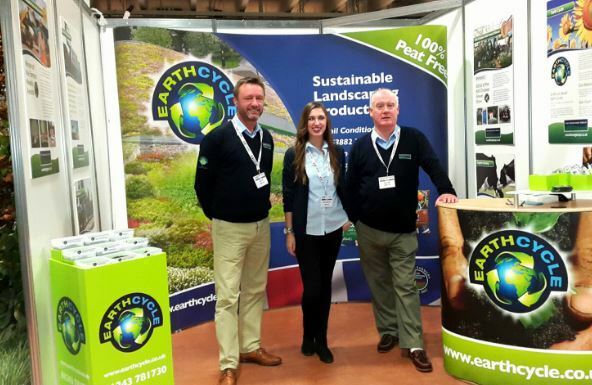 On November 17th, Mike, Phil and Sophie from our Earth Cycle team went to FutureScape where we had taken an exhibition stand. Although it was stormy outside, the atmosphere in the hall was fantastic with lots of visitors and exhibitors in attendance. FutureScape is located at Sandown Racecourse and brings together landscape contractors, garden designers and architects. ‘It attracts a variety of visitors and exhibitors, that allows for great networking opportunities’ comments Phil. There is also plenty for all to get stuck into and learn about with an array of activities and seminars, such as the 30 under 30’s ceremony and the understanding soil talk. Earth Cycle always look forward to exhibiting at FutureScape and what it has to bring. This year we refurbished our stall with a new banner, product sample box and lots of new merchandise, including a trolley coin, which visitors loved. Sophie comments: ‘when it comes to merchandise, it’s not just about giving something away for free; it’s about giving visitors something that they could actually need. If you’re helping potential customers out with something, they will in turn remember you in a better light’.